QUICK SILVER® Stainless Steel Rust Remover and Passivator is the best stainless steel cleaner for removing rust and stains from marine grade stainless steel (typically 304 or 316 grade) on boats, architectural stainless steel and other exterior stainless steel that is exposed to corrosive environments such as salt water, salt air, atmospheric fallout, pollution, corrosive chemicals, etc. 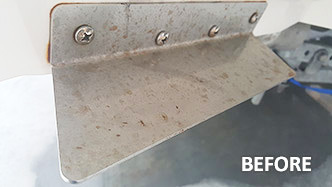 Remove lose rust and dirt from the stainless steel with a plastic bristle scrub brush and wash it with BOAT CLEAN PLUS® to remove any pollutants that can inhibit the chemical action. Brush QUICK SILVER® Stainless Steel Cleaner liberally onto rusty or stained stainless steel and surrounding rust stains*. Allow it to work for 5 to 30 minutes and rinse clean**. Repeat if necessary. Protect against future rusting with STAINLESS SHIELD® clear coat. 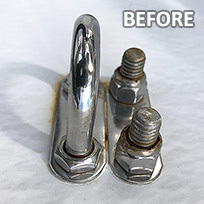 Rust and stain removal with QUICK SILVER® is quick, easy and safe. Just brush the environment friendly stainless steel cleaner onto the rusty surface, wait 5 to 30 minutes and rinse it clean, revealing bright, shiny and passivated stainless surface. After 24 hours, you can protect your stainless steel from further rusting and staining with long lasting STAINLESS SHIELD® clear coat. QUICK SILVER's unique formula is designed to work quickly and easily on marine grade stainless steel with a minimum of labor. Simply brush it on, wait, and rinse it off. It's the fastest acting, most effective rust remover for stainless steel available. 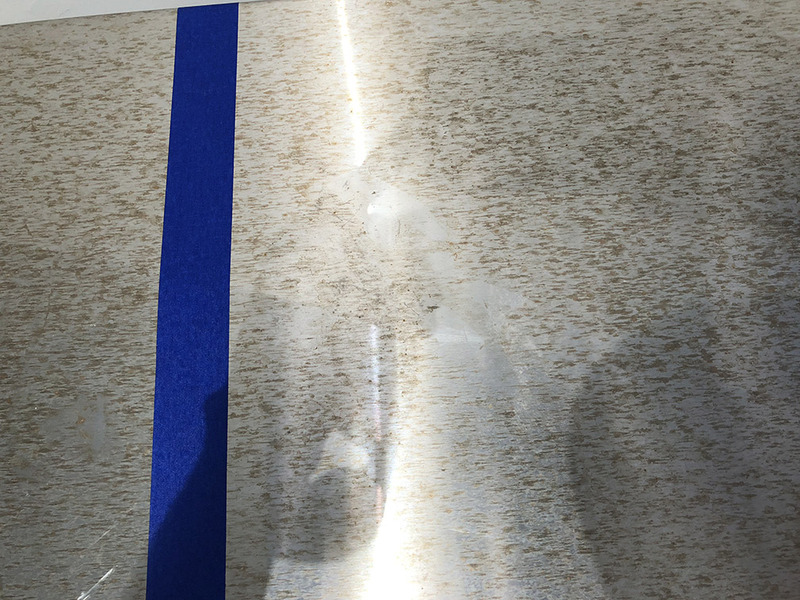 Its gel formula clings to vertical surfaces for ease of use and this also prevents premature drying, allowing the rust removal and passivation action to continue for longer periods of time until the process is complete. *TEST FIRST. QUICK SILVER® is generally safe for surrounding areas such as fiberglass, plastics, PVC, Hypalon and marine grade paint, but it's important to test a small area first to make sure there is no detrimental reaction. When you're sure that it works to your satisfaction, then continue to clean all your stainless steel. **DWELL TIME. Do not allow QUICK SILVER® to remain on surface for more than 1 hour. It seems redundant that you should brush off the rust and wash and degrease the surface before you clean off the rust but it makes perfect sense once you understand why. If you have excessive lose rust and dirt on the surface, you're going to need more QUICK SILVER® to react with that before it even gets a chance to clean the rust from your stainless steel and the dirt will just inhibit the chemical reaction to nullify its effect. Quickly brushing off lose rust and dirt with a nylon bristled scrub brush will allow the rust cleaner to get to where it needs to be much faster and easier. In the end it will save you time and money. 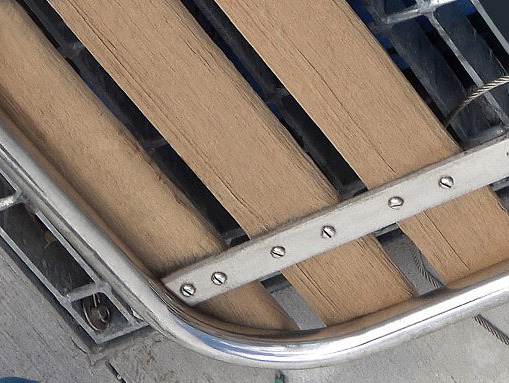 If you only have rust stains, you can skip this step. 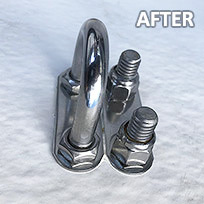 Washing and degreasing is also important to allow QUICK SILVER® to work properly; if there are oily pollutants on the surface, even if they're not visible, they can prevent the QUICK SILVER® stainless steel cleaner from doing its job properly and you could wind up with residue corrosion and an uneven finish. 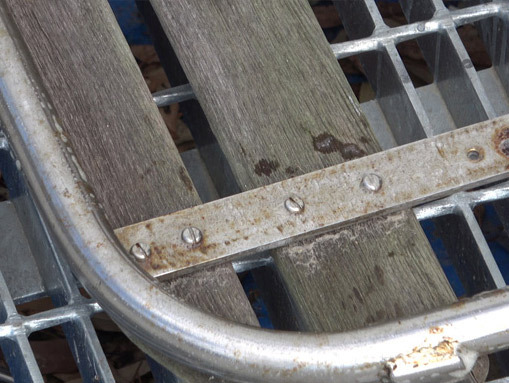 Never use a wire brush, steel wool scouring pads or sandpaper to clean off the excessive rust and dirt. First of all, they will scratch the surface and second they will leave behind traces of iron or steel which will act as initiators or seeds to start further rusting. 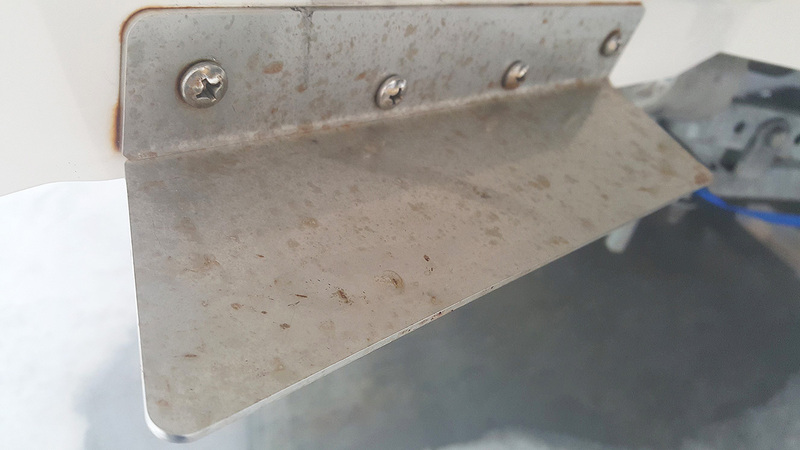 There are many stainless steel cleaners and polishes on the market, but the problems are that they typically require hard scrubbing, rubbing and polishing and as soon as the stainless steel is clean, it begins to rust again. Crevices and pits could not be cleaned properly leaving residual rust which acts as an initiator to start the rusting and staining process all over again. Chemical cleaners work better but still have the problem of not restoring the protective chromium oxide layer in order to passivate the metal. This has to be done in a separate procedure, which us usually skipped. If allowed to continue, the bright, shiny, stainless steel soon begins to corrode and pit. 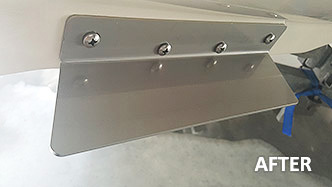 The reason that QUICK SILVER® is the best Stainless Steel cleaner and rust remover is that its new technology dissolves rust, cleans stains and re-passivates the stainless steel all in one easy step, saving countless hours of labor and eliminating the need for removing the stainless steel for passivation with hazardous chemicals at high temperatures. 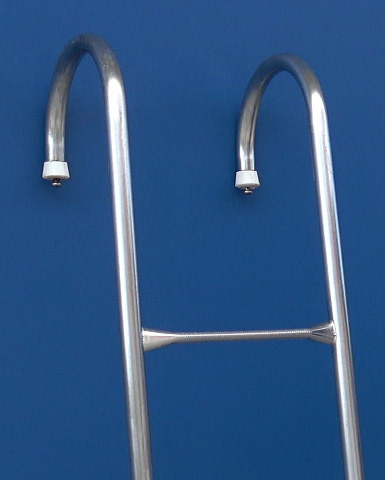 The stainless steel can be cleaned, brightened and re-passivated in place, on your boat or on site. QUICK SILVER® is a gel based formula. The higher viscosity makes the product sticky and controls the release of the active ingredients to allow the material to cling to vertical surfaces and work at rust removal for longer effective periods of time. The chelating ingredients hold the offending residue in suspension so that the creation of protective chromium oxide, known as passivation, can be generated on the surface to prevent flash rusting and retard future rusting after it's rinsed off. 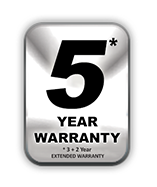 In keeping with Aurora Marine's mandate, QUICK SILVER® is Environment Friendly. It's water based and Biodegradable. Being Environment Friendly is important as often times the stainless steel fittings and rails etc. on a boat will need to be cleaned while the boat is in the water. It's reassuring to know that the effluent that is rinsed into the water will have a minimum impact of the water and marine life. When your stainless steel is clean, passivated and dry it's encouraging to know that you can easily protect it against further degradation and the necessity for repeated cleaning by applying STAINLESS SHIELD® clear coat. 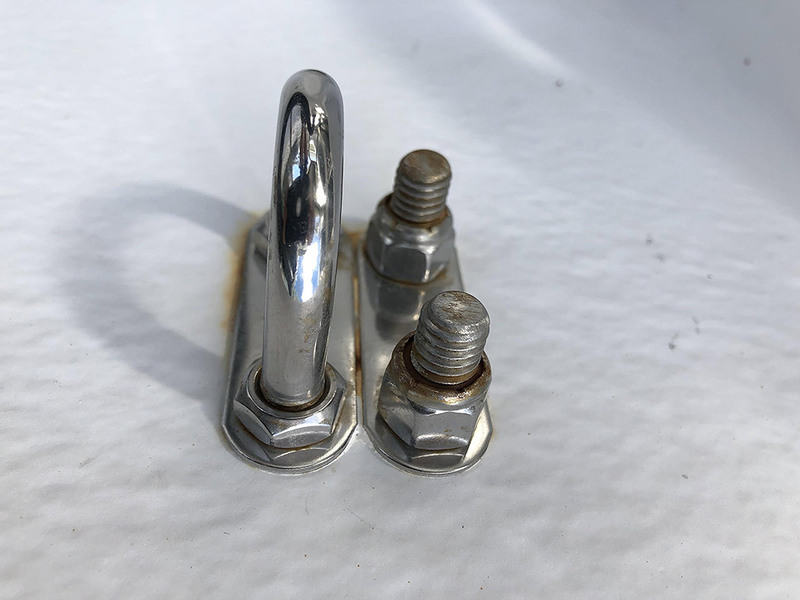 It will seal your stainless surfaces against attack for salt water, salt air and other environmental and chemical pollutants, eliminating the necessity for constantly cleaning and maintain your boat fittings and railings. This protective coating is durable and long lasting and will give you more time to enjoy your boat and require less time to maintain it. STAINLESS SHIELD® is a clear, water based polymeric coating formulated especially for Stainless Steel. It displays excellent performance as a direct to metal finish with excellent adhesion and water resistanceand no primer is required. STAINLESS SHIELD® dries to a hard and durable, clear, shiny, finish with very low VOC's and without any hazardous ingredients. It's safe to use, biodegradable and environment friendly. Understanding Stainless Steel is a bit confusing. Most people wonder why it rusts, pits and stains when it's supposed to be stainless. In fact, there are many grades of stainless steel, each alloy designed for a specific purpose. They are blends of mild steel with various concentrations of chromium, nickel, molybdenum and other ingredients that effect its strength, workability, weld ability, ability to resist (but not entirely eliminate) corrosion, etc. Marine grade typically refers to 304 and 316 grades, but there are other variations, with 316 being the most resistant to salt water and chemical attack. The way that stainless steel works is that it forms a microscopic layer of chromium oxide on the surface that is highly resistant to corrosion; its Passive State. It requires a constant state of interaction with oxygen in the air or flowing water to maintain this chromium oxide layer. If this oxygen interaction is disrupted by abrasion, or inhibited by the presence of stagnant water where the oxygen is depleted or deposition of chlorides from salt water or salt air, preventing the oxidation process to continue, the passive stainless steel layer reverts back to its Active State, similar to that of mild steel. It then begins to corrode or rust all over again. Another common factor that affects the performance of stainless steel is mild steel or iron contamination. Even minor traces of steel or iron on the surface can act as an initiator or seed for rust to begin developing. Once started, it deprives the natural oxidation process, and it can spread rapidly and burrow deep into the metal to create corrosive pits and crevices. 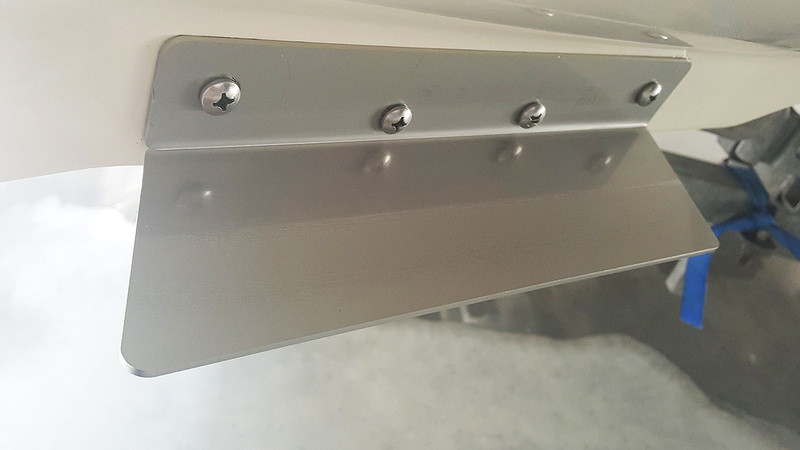 This can occur from abrasion contact with a piece of steel or even the use of steel bit screwdrivers, sockets or wrenches used to tighten screws and bolts during the construction of your boat. Trace amounts of iron are transferred from the tool to the head of the bolt or the nut, or the chromium oxide layer is ruptured from the torque, and that starts the rusting process. 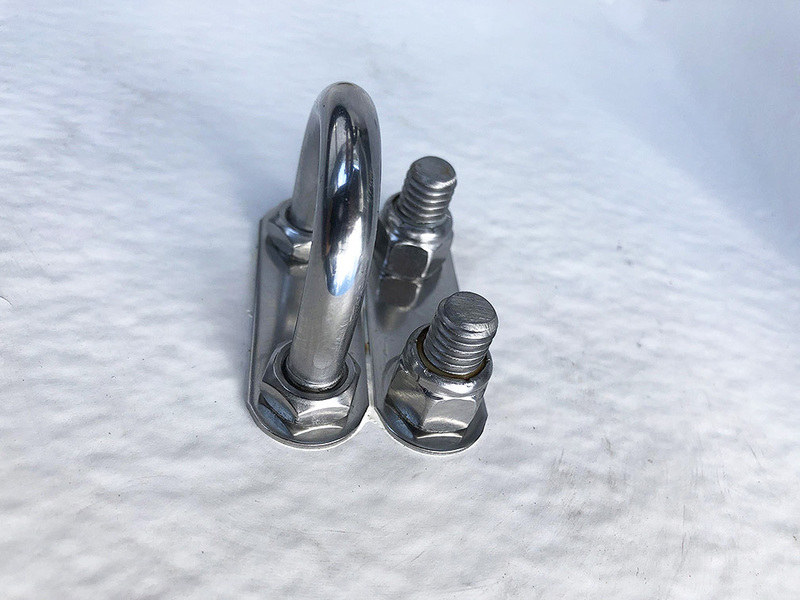 In addition to being unsightly, if left untreated, the stainless steel fitting, bolt, chain or other part can fail and break with considerable negative consequence. 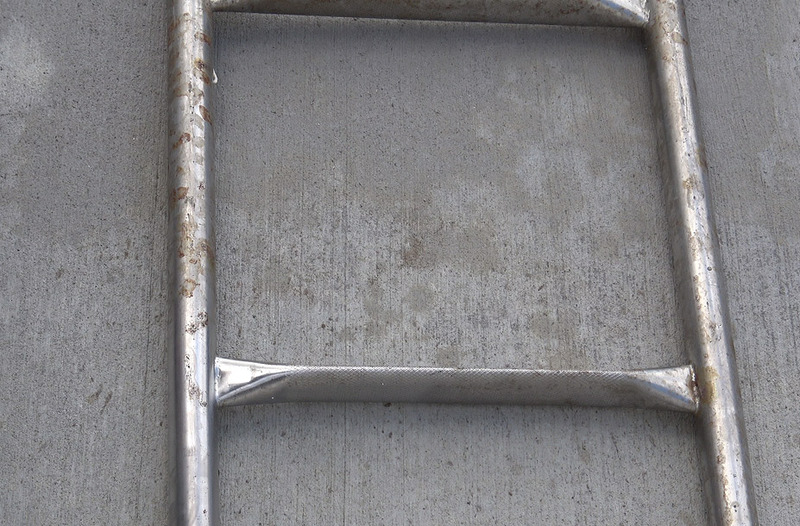 In addition to cleaning your stainless steel, and removing the rust, it's also important to make the stainless passive again by restoring the chromium oxide layer. 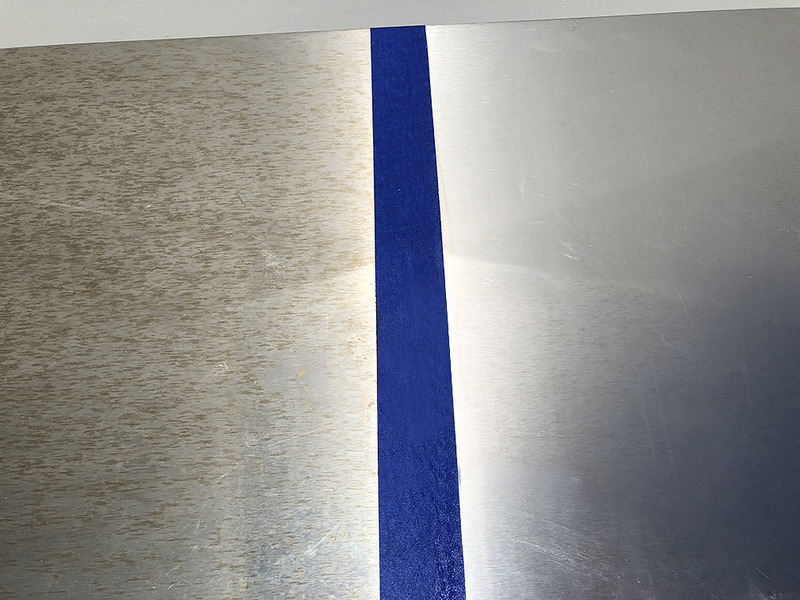 In addition to removing the rust and deep cleaning the metal, QUICK SILVER® also recreates the chromium oxide layer to re-passivate the surface. This will keep your stainless steel shiny and rust free, at least until it's attacked by another bout of oxygen deprivation by salt or rust initiation by iron, etc. The good news is that now you can add considerablelong term protection by sealing your stainless steel with STAINLESS SHIELD®. Salt and pollutants can't penetrate it. It can last a whole year or longer.